Perstel DR301 review | What Hi-Fi? It may sound like it's made by a detergent manufacturer, but this smart, sturdy pocket unit isn't content with just being an FM and DAB radio. It also includes an SD memory card slot, so you can record DAB radio on it and play MP3s from it. It's powered by three AA batteries or a mains adapter(not supplied), but while it's easy to find stations on the FM tuner, there are only three presets. Switch to DAB and, after a quick scan, the '301 throws up over 50 stations – all presented with scrolling station info and the right channel labels. Other useful features include the ability to rewind the last minute of any DAB broadcast, or to record at the bit-rate of your choice, ten minutes at 128kbps using 10MB of SD card capacity. File transfer is PC-only, and the DR301 works with MP3 and WMA formats. MP3 or DAB sound via the supplied earbuds is on the bright side, but upgrade to a decent pair of headphones, and things are far more balanced. 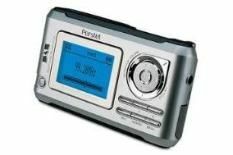 If you want DAB and MP3 in one, the Perstel is a great option. Try it!